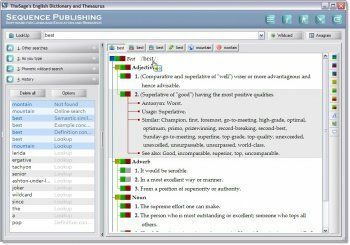 TheSage is a comprehensive English dictionary and thesaurus that provides a number of useful and in some cases unusual search tools. It runs locally, and does not use your Internet connection. 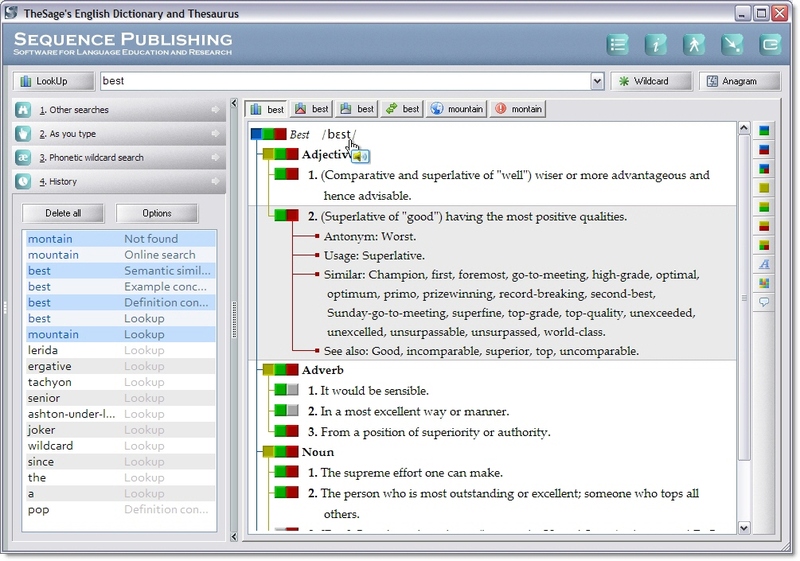 The essential functionality includes the following: tabbed interface allowing multiple definitions and searches to be readily available, quick cross-referencing; standard and advanced wildcard search functionality; anagram search; history and session record keeping; options that allow customization of the appearance of TheSage; copy to clipboard of all or part of the information displayed. I've been using The Sage for ~years~. It's an exceptional resource, and something I always install on each of my new computers. Outstanding in every way, small foot print and does what it says on the tin. I've used TheSage for some years; it's excellent software and it's well worth making a small donation to keep the project going. Unless you're Shakespeare and never lost for words, then you'll find this dictionary, word-finder and thesaurus invaluable. The perfect English dictionary for looking up words, meanings, spellings and alternative words. However, fileforum has dropped the ball on providing the most recent version. Get it from their home page. A free software of outstanding quality. Thank you so much! Brilliant, elegant (that stands for BetaNews' new design as well) ! "TheSage can look up words directly from almost any program (IE, Word, Firefox, Outlook, Thunderbird,... "
Very good. Have been using Wordweb, but am now giving this a try. Really excellent software. Fast and easy-to-use. A must-have for anyone who writes or reads. In addition to other superb things, this is portable, indicating that this may work also in Linux through Wine. Massively good stand alone, but offers tabbed embeed clean nice net browser which shows easily parallel pages from net and you can add dictionary /translation sites. It's a wonder such a good thing could be free. I wish there is also a Linux version. It works with no problems and gives you more than you ask for!